Thai election officials have begun counting votes in Sunday’s closely watched general election after polls closed at 5pm local time, with unofficial results expected within three hours. The election commission earlier projected that around 80 per cent of the 51.2 million registered voters cast their vote in 92,320 polling stations across the country’s 77 provinces. The polls are Thailand’s sixth in two decades, and like in the previous five elections, there are two major blocs vying for power – the royal military establishment and the rural-backed populist movement linked to the billionaire former prime minister Thaksin Shinawatra. Exit poll data released by news channel Thai PBS after polling closed showed the Pheu Thai Party linked to Thaksin winning the most seats – 163 out of 500 parliamentary seats. That threshold, however, is not enough to form a government. Their chief rival, the military-backed Palang Pracharat, is projected to come in second with 96 seats. Another poll by Dusit University showed Pheu Thai winning 173 seats and Palang Pracharat winning 96 seats. This is the first election since junta chief Prayuth Chan-ocha toppled a Shinawatra-linked government in 2014. It is being held after being postponed several times and under a new constitution crafted by the junta. Observers say the polls are one-sided on account of just that fact, as the new rules – including sweeping powers granted to the military-appointed Senate – hand the Shinawatra faction a major disadvantage. Prayuth is Palang Pracharat’s prime ministerial candidate. King Maha Vajiralongkorn, presiding over a general election for the first time since he took the throne in 2016, late on Saturday issued a statement urging his subjects to choose “good people” as their elected representatives. The monarch added that keeping peace and order in the country required voters to “prevent bad people from grabbing power and creating trouble and unrest”. The statement was broadcast for a second time on national television channels just before 8am. Enthusiasm among voters was rife even as some waited in long queues under the scorching heat before casting their vote. At a polling station in Bangkok’s Ekkamai district, mother-daughter pair Ussadee Adam, 47, and Somboon Adam, 73, said they believed the polls would bring “positive change to the country”. “I think Thailand will change for the better,” said Ussadee. Sukitta Pongradej, also a Bangkok resident, said there was a palpable excitement surrounding Sunday’s election owing to hopes that civilian rule will finally return after five years. “I have hope that Thailand will be better … but I am not sure about whether we will continue to remain under military rule,” she said. Social media users meanwhile were quick to pick up on election day quirks and gripes. In the northern province of Chiang Mai, voters not only braved the heat but also thick smog as they wore masks to their polling stations. A picture of a lady casting her vote wearing a wedding dress was widely circulated online. Also grabbing attention online were reports of six people being arrested for tearing their ballot paper. There are 500 parliamentary seats – 350 constituency wards and 150 party list seats – being contested by 77 political parties. For the first time, only one ballot paper is being used for each voter to pick their constituency lawmaker and party list MPs. Party list seats will be allocated based on parties’ total popular vote. The 500 MPs and the 250 junta-appointed senators will each have a vote on who becomes prime minister. The biggest player is the Pheu Thai Party, victor in the 2011 and 2014 election and the reincarnation of Thaksin-linked parties that won the 2001, 2006 and 2007 vote. The Pheu Thai Party was in power in May 2014 – helmed by Thaksin’s sister Yingluck – when current junta leader Prayuth successfully staged a coup against it. The putsch was the country’s 12th successful coup in 82 years. On the opposing side is Prayuth’s Palang Pracharat Party, formed last year by his key lieutenants. Thaksin’s party mainly taps on support from the country’s most populous northeast section, home to the Laos-influenced Isaan people. The region is particularly loyal to the Shinawatras because of the raft of economic sweeteners Thaksin offered them during when he was in power from 2001 until his ousting – also through a coup – in 2006. Palang Pracharat, on the other hand, hopes to capitalise on urbanites’ revulsion of the Shinawatras on account of their populism and purported use of politics to advance their vast business empire. Nonetheless, the Palang Pracharat says it has also made some inroads in the northeast. Other players include the Democrat Party, a neoliberal outfit that finished second best to Pheu Thai in the last five elections. The newest kid on the block is the Future Forward Party helmed by the charismatic Thanathorn Juangroongruangkit, scion of an auto parts empire. Observers believe 40-year-old Thanathorn’s star power will attract the support of the nearly eight million first-time voters. Thanathorn and Prayuth were among the high-profile prime ministerial candidates to cast their vote early on Sunday. 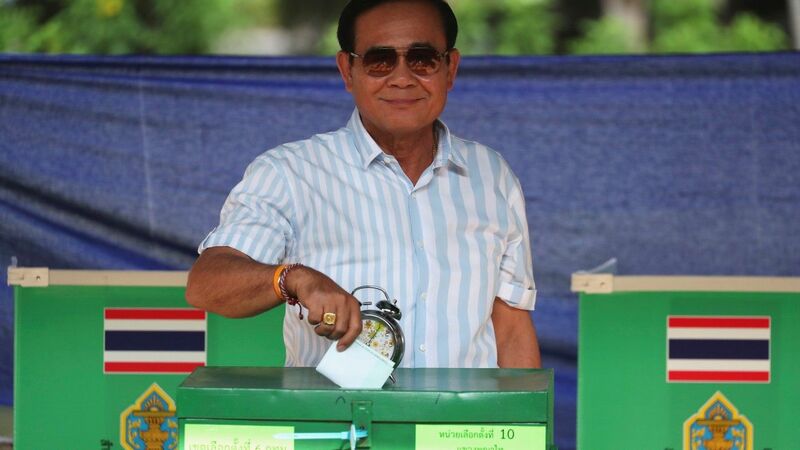 Also casting his ballot in Bangkok was the powerful army chief Apirat Kongsompong. Political analysts say the general – an ardent loyalist of Vajiralongkorn – could stage a fresh coup if the outcome of Sunday’s vote is deemed to be against the interests of the military. The election commission has said 95 per cent of results in the 350 constituency seats will be tallied by around 8pm, three hours after polling stations close. There will be no formal announcement on the allocation of the 150 party list seats for now. Prayuth’s junta will remain in power until after the May 4-6 coronation ceremony of King Maha Vajiralongkorn. The monarch’s statement on Saturday harked back to a 1969 speech by his revered late father King Bhumibol Adulyadej, who, despite the country’s near-constant political stand-offs, served as a unifying figure during his record breaking seven-decade rule. Observers say Vajiralongkorn has yet to prove his mettle as a neutral arbiter among the country’s competing political forces. The hashtag #oldenoughtovoteourselves was trending among Thai Twitter users on Sunday in response to his late night statement.